Many Latvians think of Siberia as a wintry hell that swallowed up thousands of their compatriots during Stalin’s rule. However, in a much less known story, this vast territory is also home to the village of Lejas Bulāna, a place that can probably claim to be the longest surviving Latvian diaspora settlement in the world. While most Latvians in the West arrived in the same migration flow in the early 1950s, those heading to the East have been a much more varied bunch. During World War I, much of the population of Latvia fled to Russia to escape the invading Germans. Some of them couldn’t return to their homeland after 1918, while many committed communists willingly stayed on. The post-revolutionary Latvians in Russia published newspapers, ran schools and theatres, and provided numerous high-ranking officials in the Bolshevik regime, who were massacred in the purge of the 1930s. Quite a few who survived the 1940s deportations from Latvia chose not to return home after Soviet leader Joseph Stalin’s death and are still living in Russia to this day. They were joined by thousands of others in the 1960s and 1970s who moved east to take up jobs or join spouses. Kosman said he wished to settle in Bulāna full time and asked the villagers to build him a house and tend some fields to support him. But they objected to what they saw as a reintroduction of German and baronial authority—and sent him packing. Occasional clashes were reported between the German and Latvian residents of the village, but after a few generations it seems that the Latvians assimilated their neighbours. Early in the life of the colony gold was discovered in the nearby Sayan Mountains. Many young men departed to seek their fortunes. Driśis describes the short, turbulent lives of the miners, most of whom returned to Bulāna from the diggings in autumn, caroused away their money, and were indentured by leaders of mine gangs who paid off the drinkers’ debts in return for work. However, the land proved to be a more durable resource. The rich black soil and short, hot summers of this area allow the growing of many crops, including sunflowers and watermelons. In addition to these natural advantages, Driśis wrote that the sturdier pioneers, often those deported for trivial offences, thrived away from the dominating German landowners in Latvia. Free to chop timber and use meadows where they pleased, the settlers began writing home that they had found a land “where milk and honey flows.” Free settlers began moving in. According to the 1897 Russian census, the village had 910 inhabitants, of whom 786 were Latvians. In that year in Western Siberia as a whole there were 6,768 Latvians, 4,082 Estonians and 2,038 Lithuanians. The village church was converted into a social club after its steeple was torn down. Religious books were destroyed. And the saying that he who burns books will soon burn people came to fruition, as Stalin’s mass purges decimated the Latvian population in Russia. Bulāna also fell victim with dozens of men taken away on trumped-up charges and shot. 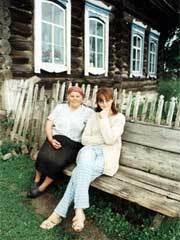 The old villagers remember the years after Stalin’s death in 1953 as a time of relative peace and prosperity. Bans on peasants leaving their villages were lifted and people were paid for their work on the kolkhoz. And despite the horrors, the village managed to keep its Latvian identity. 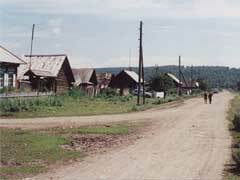 This was partly due to Bulāna’s isolation: the nearest town of any size is about 25 kilometres away. Until about 20 years ago no roads led to Bulāna, just pitted tracks that became unusable in bad weather. Naturally, some Russian words and phrases have become a part of the villagers’ vocabulary, but the dominant language is still that of their ancestors. The Bulāna dialect is clearly understandable to speakers of standard Latvian, but shares some features of the tongue spoken in Ventspils district in northern Kurzeme. Endings of words are chopped off in speech, and there are no genderized pronouns (both males and females are spoken of as viņš, or “he”). Another oddity is that some German words are substituted for Latvian ones, for example, gapele instead of dakša (fork) or ķisenis instead of spilvens (pillow). These words may have been picked up from the Germans who lived in Bulāna in its early years, or it may be that the language in Bulāna has retained elements of speech common in Latvia in the 19th century, when German cultural influence was strong. Although they complain that their memories are fading, the old women still know many songs. Lots of them are folk tunes that would be familiar to Latvians elsewhere, although the melodies and inflections in the voices have local variations. Another idiosyncrasy is the celebration of Jāņi, Midsummer’s Eve, which still involves Latvian traditions such as bonfires and cheese-making, but takes place two weeks later than in Latvia, in line with the Julian calender that was used in the Czarist Empire before 1917. Despite its problems, Bulāna has lived through much worse times, and may very well survive into the foreseeable future. Its people’s courage, resilience and pride in their heritage can be an inspiration to Latvians elsewhere in the world. Paldies par labu rakstu un ļoti vērtīgiem datiem attiecībā uz visarioniešiem, kas itkā pastāv ārpus Laika & Telpas. Latvijā uz doto dienu ir visai līdzīga tendence šobrīd uzsākta caur t.s. Durakovo klostera (Orlas apgabals,~100km pie-Maskava) pieredzes ienākšanu. P.s. Patīkami ir tas, ka i-neta lapas atvērumā ir vienlaikus ir dots gan fiskālais notikums, gan ar reliģiju,tātad, ārpusfiskalitāti saistīti ufoloģiski kritēriji, kuri patiesi ir visai nozīmīgi tiem cilvēkiem, kas nezin pagaidām vēl to, kas viņus sagaida aizkapa dzīvē un kā norisināsies Raudive Voices (Raudives Balsu-angliski) analīze, darbības realitāte. Thanks about good article about reality on the Earth. P.s. It is good thing that serching about religious way of mesiah development.